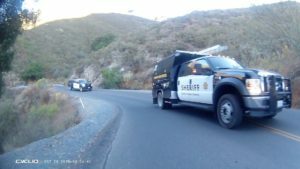 On Oct 20, 2018 several Contra Costa County Sheriffs vehicles were observed crossing Solid Double Yellow lines and Passing Cyclists on Blind Curves. The CCC Sheriff Search & Rescue Team realized their actions on that day could of resulted in a Bike vs Vehicle Collision! 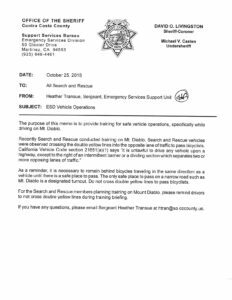 As a result, Mount Diablo Cyclists worked with the CCC Sheriff to create the following guidance below. Special Thanks to the CCC Sheriffs Search & Rescue Team!!! SGT Transue was Outstanding! It was a pleasure working with her and the Search & Rescue Team! Great group of volunteers!